Ho Ho Ho..... with or without the rum, this creamy beverage is fun to serve at a Christmas party or enjoy a cup while you're watching "It's a Wonderful Life". This recipe will keep covered and refrigerated for a couple of days. 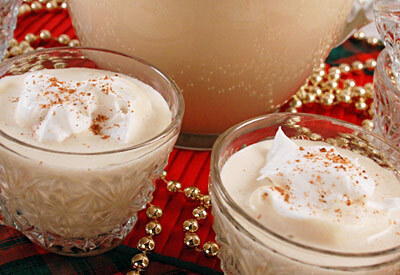 Mix coffee, eggnog, one container of whipped topping and cinnamon in large bowl with wire whisk. Stir in rum. Refrigerate until ready to use. Top each serving with a spoonful of whipped topping and sprinkle with nutmeg.